DTS Spinal Decompression Therapy is a non-invasive, pain-free solution to chronic pain originating from the neck and the lower back. It has proven very effective in reducing and even eliminating chronic pain resulting from a spinal injury. It works by gently stretching the spine, relieving pressure on the discs, joints, and muscular tissues, to enhance the body’s natural healing process. Our clinic performs the therapy using the Triton DTS, the most advanced DTS machine available today. The gentle pressure of the Triton DTS allows the spine to decompress and return to its proper positioning, in turn improving blood flow and essential nutrient exchange to the injured area. This allows the body to heal itself in the manner nature intended, without synthetic drugs. Your well-being and safety are of utmost importance during DTS Spinal Decompression Therapy. If you are not comfortable while using the device, you will simply not get the best results. The Triton DTS we use allows you to choose your position during therapy to maximize comfort, a feature not offered by other devices. Instead, they shoehorn you into whatever awkward positioning the device was built around. Does that sound pleasant or efficient to you? With DTS Therapy, you’ll experience multiple cycles of stretch and relaxation, which gently reach a peak over a period of several minutes. The duration of therapy sessions is usually 20 minutes or less each. Most patients feel pain relief with as few as 6 — 10 treatments. This does not mean that your injury is completely healed, however. It is important to continue to follow all of the rehab protocols recommended by your doctor, even if your pain completely disappears, to get the most out of DTS Therapy. CALL US RIGHT AWAY TO DETERMINE IF DTS SPINAL DECOMPRESSION THERAPY MIGHT BE RIGHT FOR YOU! If DTS Therapy has been recommended for you, you probably have a few questions. “How well does this work?” “How will I know if this will work for me?” The truth is, you will decide how well DTS Therapy will work for you. Getting the most benefit out of your therapy sessions depends on several factors. Our checklist below explains both what you should NOT do and what you SHOULD do to maximize the treatment’s performance. First off let’s go over what you should NOT do. • Avoid sleeping on your stomach. 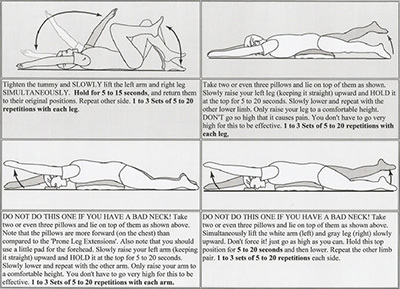 If your sleep position is on your back, prop your knees up with a pillow to maintain proper spinal positioning. • Stay away from jarring activities, especially if they cause pain. • Avoid consumption of junk food or fast food. • Drink at least one liter of water for every 50lbs of body weight each day. • Try to walk for at least 10 minutes every day. Swimming is another great way to exercise that won’t further injure your spine, if you can avoid jumping and diving. Please do not over do it. In this case, less really is more. • Lose weight, if applicable. Your spine was not designed to carry additional weight all day every day. • Make sure to keep all your appointment with us. • Think positive by only concentrating on what is better, not what is still wrong. • Get adjusted on each visit. • Do the adjudicative therapies on each visit, such as ice, heat, and electric stimulation. • Take the time to rest. Resting is one of the things that many of us forget to do. Without proper rest, your body will not have the energy it needs to heal your injury. • Find the stress in your life and get rid of it. If that is not possible, at least identify and deal with it.